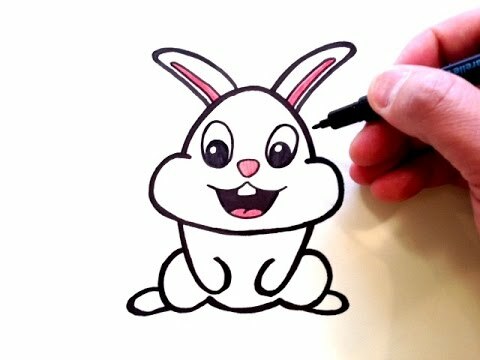 Draw a triangle directly under (touching) the nose and ending on the “lip” line. Same thing here – draw a circle with a line going through the center vertically and horizontally. Once that’s complete, draw the rest of the hair. To give his hair more volume, draw your outlines further away from the head, but make sure the distance is somewhat consistent or else the head shape may look unrealistic. Split the bottom section of the face in half and then in half again. Draw the cheeks and jawline by connecting chin to the circle. Don’t forget to keep your lines light. We’re going to give the face more definition later. The lighter your lines are, the easier it will be to erase and make changes. I noticed that when drawing males with thick outlines around the mouth, they turn out looking more feminine. 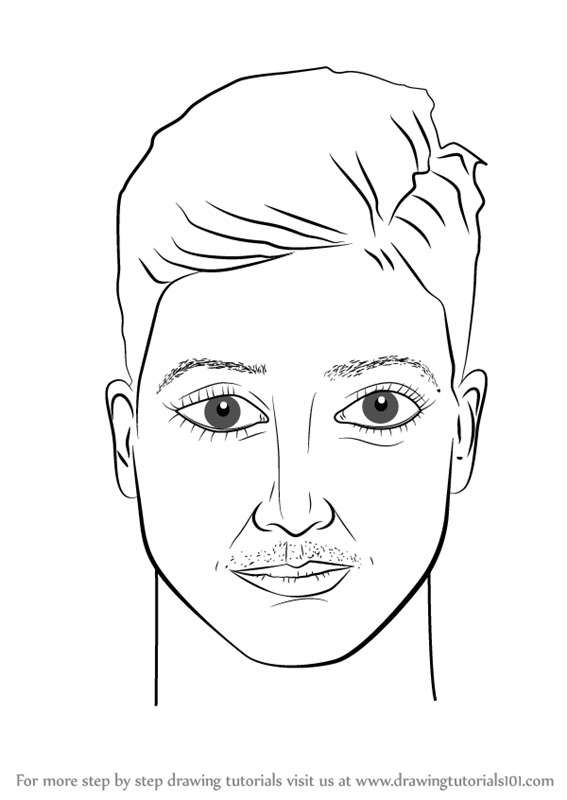 You can lighten the outlines to make a pair of lips look more masculine. Again, draw a set of boundary lines coming down from the inner corner of each eye. 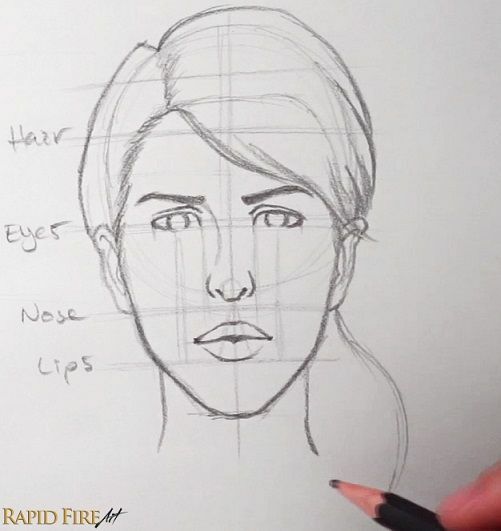 Draw your nose a little higher than the ‘nose line’ for a medium length nose. Once you finished the hairline, draw the rest of the hair. For a super detailed tutorial on drawing hair, visit this tutorial. One the line labelled eyes, split the head into 5 equal sections while taking the full width of the head into account. Before we draw the nose, we’ll need some boundary lines. Draw a line coming down from the corner of each eye and stopping at the line labelled “nose”. Draw a circle and then make a line through the center vertically and horizontally. Try to keep your construction lines as light as possible. If you can’t draw a good circle, don’t worry! Trace a round object such as a cup or a roll of duct tape. Note: Thanks to Pranab Mahajan for reminding me to add this little detail – If you find it difficult to split the face into 5 equal sections, measure the width of the head using a ruler and divide your number by 5. Finally, give him a thick neck and add the shoulders as well. 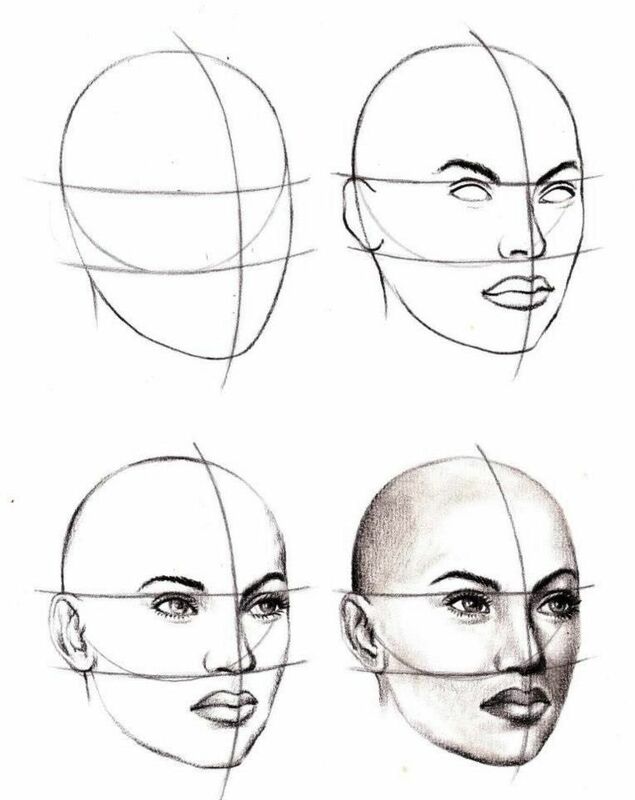 Draw the hairline by creating a very angular shape that is well defined. Draw your eyes in the appropriate spaces. Click here for a detailed tutorial on drawing eyes. Let’s draw the nose within these boundaries. For a medium length nose, draw it above the nose line. Don’t be afraid to experiment with drawing dis-proportioned faces. Stretch your imagination and just have fun with it! Draw Various Female Faces The original face looked sad. When I made her eyes wider, her sadness disappeared instantly! I didn’t even need to change the eyebrows. And then I changed her lips and lowered her nose. 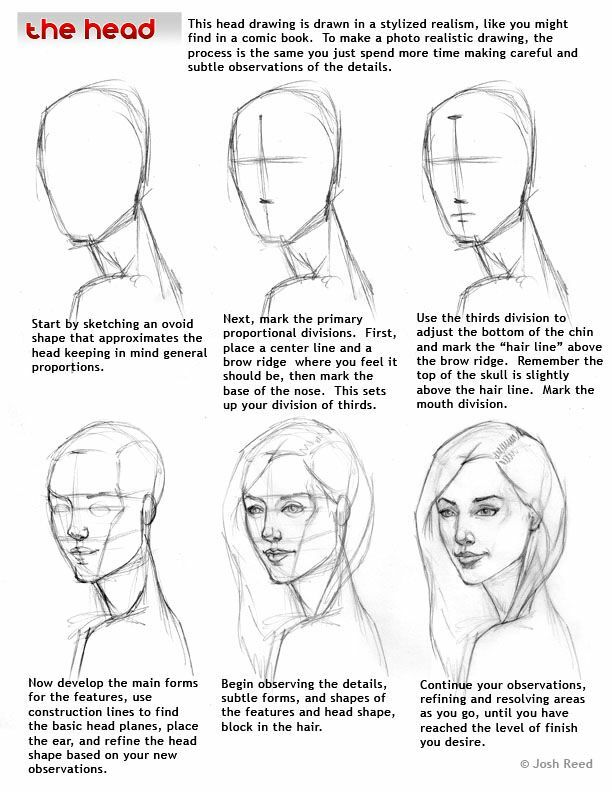 Here’s a quick and easy method for beginners to draw male and female faces. 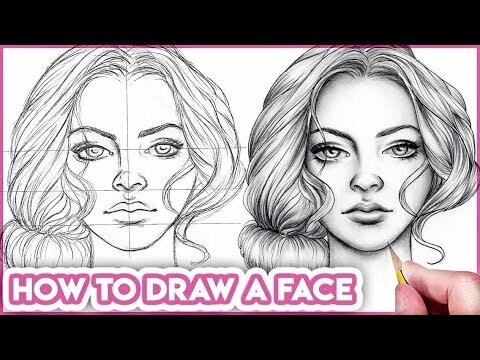 In this tutorial, I’ll draw 2 basic faces and then I’ll demonstrate how some easy modifications can affect the overall look of the face. Females tend to have softer, more rounded hairlines compared to males. Draw a smooth line around the forehead without making many sharp angles. Make sure to keep your lines fairly light as well. Move your features around, make them bigger, smaller, longer, shorter or place them further apart. The possibilities are endless! Draw the cheeks, jawline and chin using smooth lines. A square chin can make your drawing look a lot more masculine (not that there’s anything wrong with that!). For a medium length mouth, draw it well within the boundary lines. Rest the bottom lip on the line labelled “lips”. 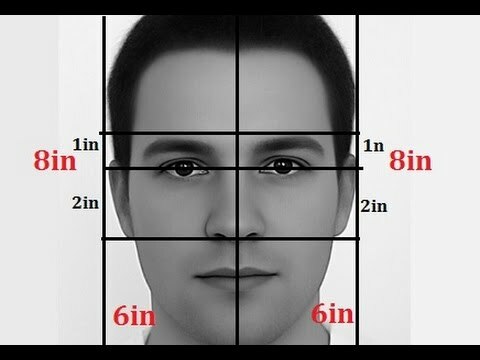 Example: If the widest part of the head is 6cm, divide it by 5 to get 1.2cm. Then split the head into sections of 1.2cm each. On the line labelled eyes, split the face into 5 equal sections. Make sure you take the entire width of the head into account. Through the center of the head, draw a vertical and horizontal line. Drawing narrow eyes can make a face look more chill and relaxed. The more visible the iris is, the more alert, intense, surprised, innocent or even angry the face will look. Sharper, broader angles can make him look stronger, more masculine Try different eye shapes too. 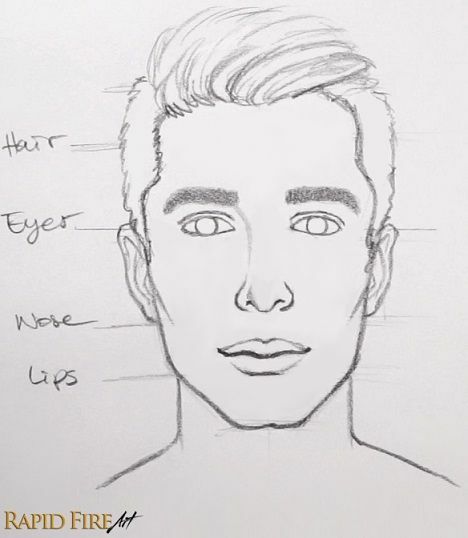 I tried to make him look southeast asian by turning his eyes up at the ends, making the tip of the nose less pointy and giving him a pair of well defined lips. Try to turn your character from a man into a boy by simply making his jawline narrower and smoother so his bones look less developed. See if you can age him by adding different types of facial hair too! We’ll need some boundary lines for the lips as well. Draw a boundary line coming down from the center of each eye and stopping at the line labelled “lips”. Measure half the circle’s diameter and add it to the bottom to get the chin, except THIS time, draw the chin slightly shorter. Create your boundary lines coming down from the center of each eye. Important: Before we move onto the next step, erase the horizontal line inside of the circle. Draw your triangle directly below the nose and resting on the line labelled “lips”. To find out where to draw the chin, use your ruler or pencil and finger to measure half of the circle’s diameter (from the bottom of the circle to the horizontal line), then transfer your measurement to the bottom of the circle and draw a line for the chin. 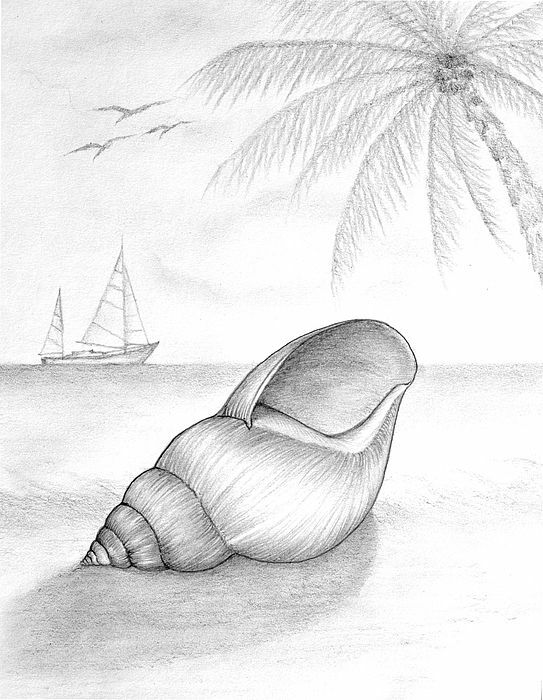 You can keep your construction lines to aid in the process or erase them and use the faint lines from your erased features to draw a slightly different one. Give the cheeks, jawline and chin some more definition. I gave him a sharp jawline with a dimpled chin. To make someone look skinnier, you can draw some subtle lines to shape the cheeks. To finish it off, give her a narrow neck compared to his. A thick neck may indicate a muscular individual. Erase the horizontal line inside of the circle and then draw a line going through the center of the head vertically and horizontally. 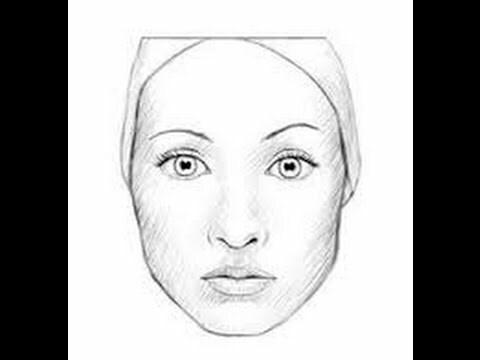 For a more feminine face, draw a narrow nose using soft lines that are not too angular/sharp. For the nose-bridge, draw a smooth curve that’s not too dark. 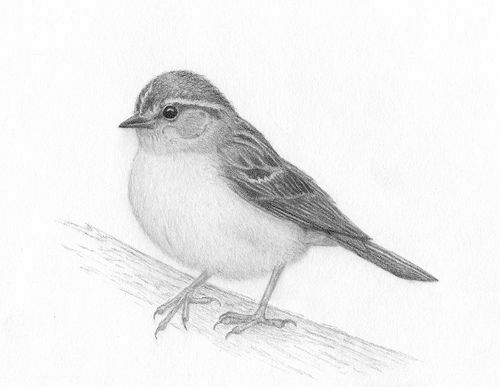 Try to sketch very lightly so you can easily erase mistakes as you go along. This will also be helpful for the last part of the tutorial where we’ll swap out facial features to play with the way our characters appear. I used a 2B for this tutorial so you can clearly see what I’m doing, however I recommend using an HB or harder pencil grade. This is the most fun part of creating this tutorial! Once you’ve created a face, you can easily change the features to test out different looks: hairstyles, lips, nose lengths, eye shapes, etc… The possibilities are endless and it’s also a great way to learn how each facial feature impacts a character’s emotions. For females, I like to draw a narrow face with a narrow jaw. For the chin, taper your lines in so the chin is more narrow compared to the male. I erased the construction lines to show you his face without obtructions. You can keep these construction lines to aid you at the end of this tutorial when we swap out facial features to transform our characters!